Measures the Speed of the car. Provides variable voltage adjustment from 5 to 19 + Volts to break in your motors. Dyno is able to test pickup shoe hangers for maximum electrical conductivity between pickup shoes & hangers, for both T-Jets & inline cars by pushing them backwards. Provides the exact load the engine sees while running down the track. Enables you to hear if the gears are meshing properly at race voltage (+19 volts) and observe if the tires are running straight or if they are wobbling. Able to differentiate the Torque between 2 cars (Using the “VRP VAMP Meter” that reads in milliamps (1-999 Milliamps ) for both T-Jets and inline cars. Close-up access to adjust the speed on G+, G3R cars by turning the end bell, and on the T1, T2, T3 and Tyco style cars by adjusting the brush hood screws. Swap Motors to choose which works best in a given chassis. Change brushes and observe a speed difference. Push in on pickup shoes and observe speed change. 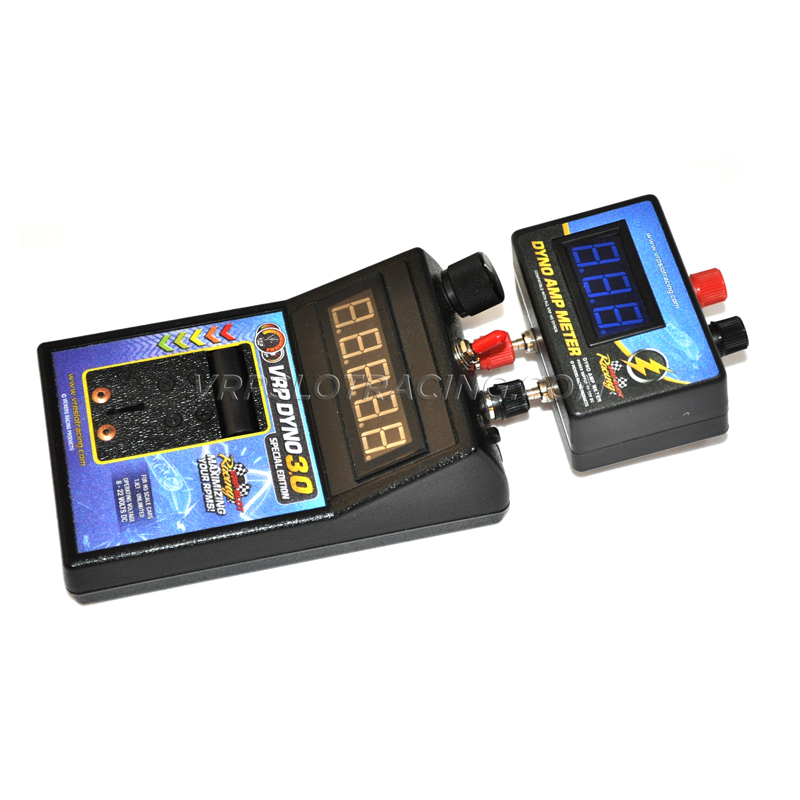 Use the Dyno VAMP Meter while tuning to observe which motor or car draws the least current. (Note: If 2 cars registers the same speed on the dyno, the one drawing the least amount of Current will run faster on the track.